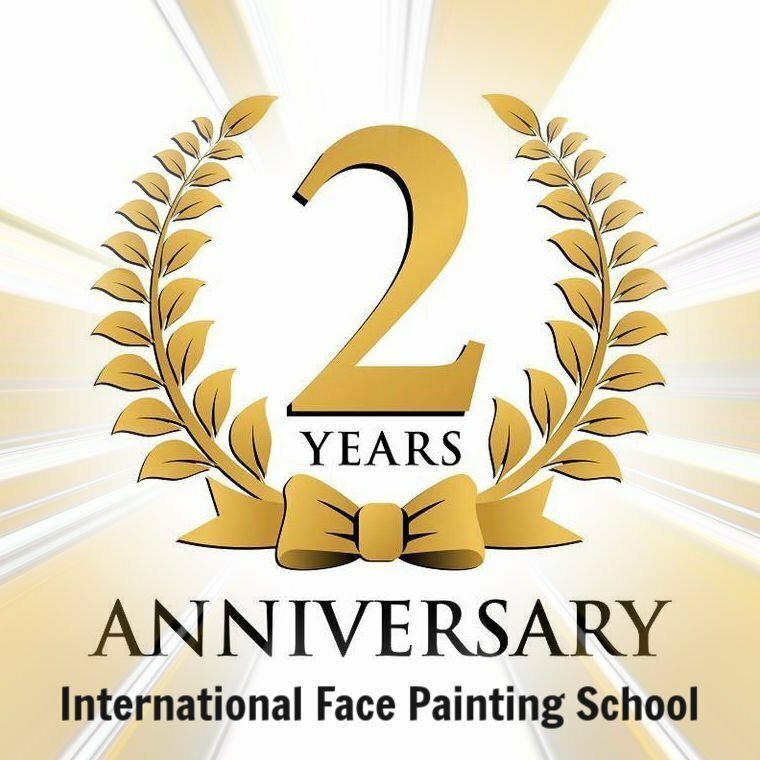 The International Face Painting School is turning TWO! 2018 was indeed a very busy year. 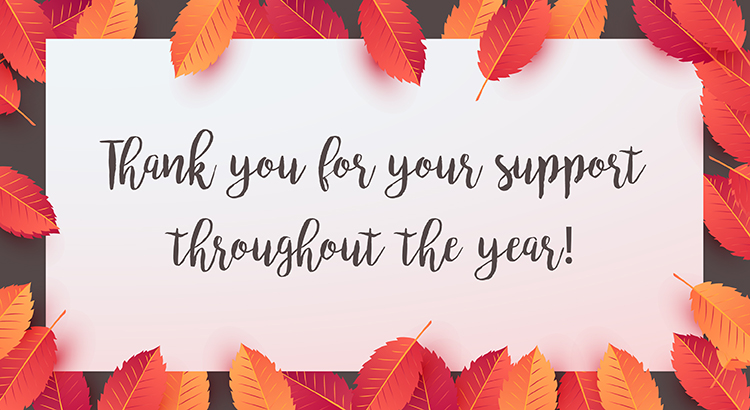 We worked hard on improving the quality of the studies, on implementing new training techniques, introducing new instructors, adding new content, writing new blog posts and so much more… that we barely had the time to tell you about everything that we’ve accomplished over the second year of our activity. We are proud to say that the number of our students has doubled over the last year and that we already cover more than 600 students from 44 countries of the world! 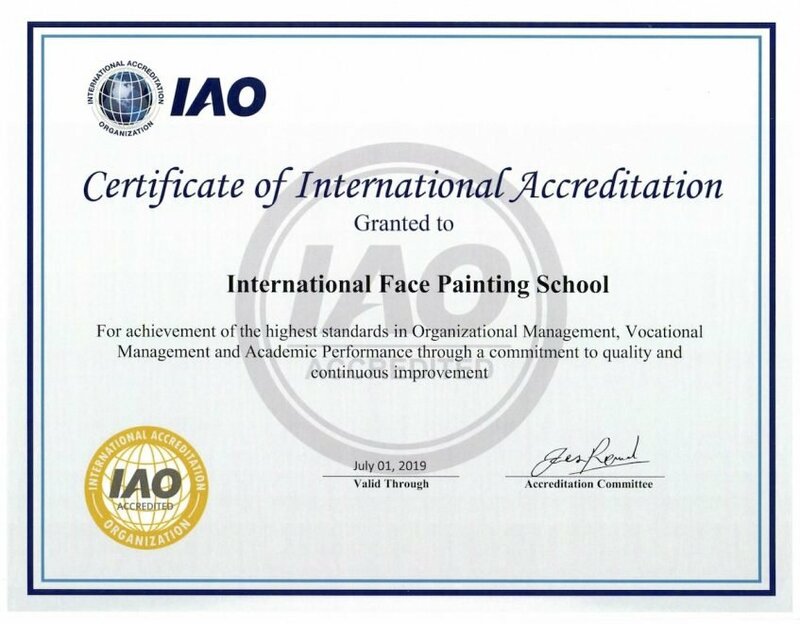 Besides that, over the past year, we’ve certified more than 150 face painters, that now own unique proof of their professionalism — a certificate of completion or a diploma of graduation. Therefore, read our earlier post The Payoff: The Graduates of 2018 Discuss Their Success & The Investment They Made in Themselves to see for yourself how the School is changing lives. And now, let us present you our second-year report! Tip: Check out the incredible before and after artwork in Achieving Greatness: How the School is paving a pathway to success. We’ve split the program into the mandatory and optional parts to help our students with a more streamlined and effective approach, customized for you. 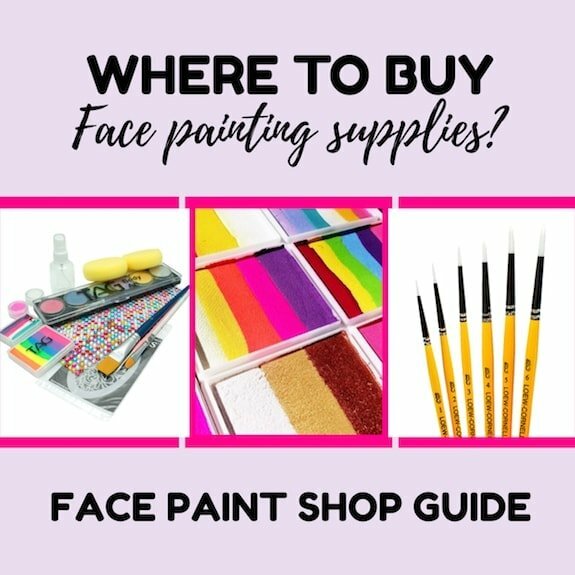  Check out our Curriculum for more details on what exactly we teach. We’ve introduced additional tasks for creating own original designs, that help our students find their own creative flow and become independent and original artists. 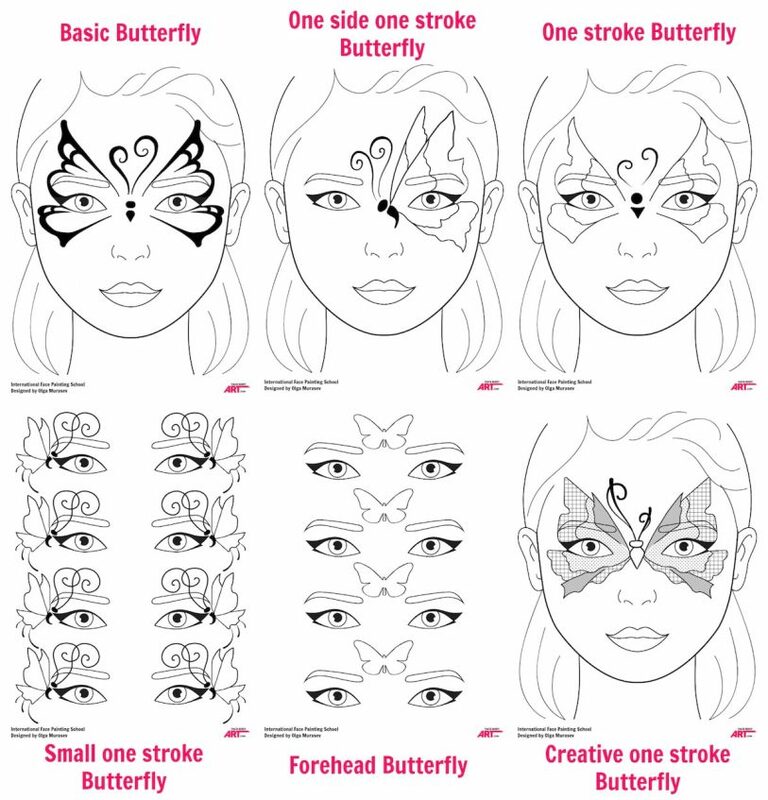 We’ve added templates for linework, butterflies, and 9 mandatory designs that help our students polish their skills much quicker and effective. We’ve introduced checklists to help keep track of the progress during the studies. We’ve added a new and thorough Module dedicated to Business and Marketing in face painting. 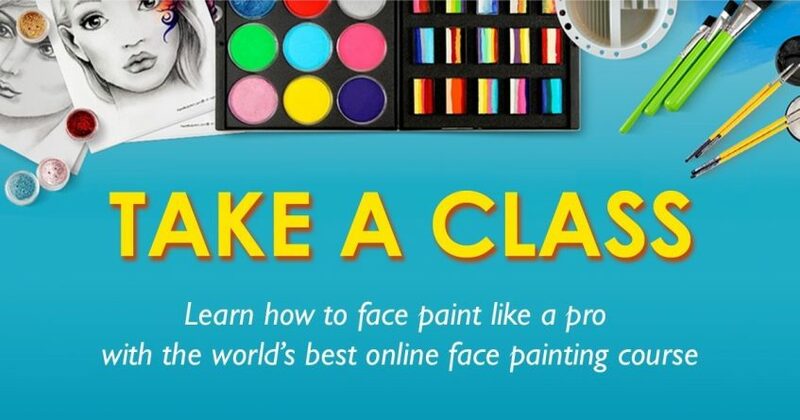 We’ve added new content in Part One of the Course, presenting the most relevant information about the tools of trade: brushes, sponges, pressed powders, paints etc. By the way, did you know that you can take a FREE WORKSHOP on linework? 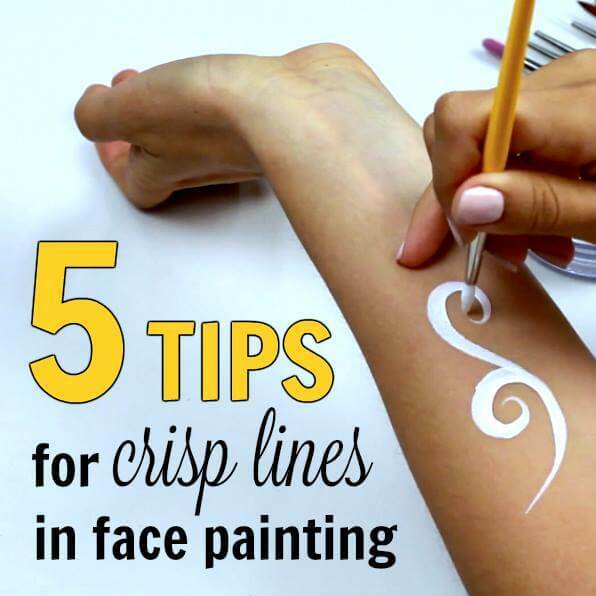 That’s where you can polish your linework skills to perfection in just three days! And as an extra bonus, you can purchase our famous set of linework templates, that are normally available only for the IntFPS students! As you may remember, the Elite Course was temporarily closed for renovation. We took advantage of that time to thoroughly train our new instructors. And voila! We’ve successfully introduced two incredibly talented and mindful instructors — Kristin Olsson and Annabel Hoogeveen, that are already guiding dozens of our students on Elite Course. Our students love the support they are receiving along the training at the School! 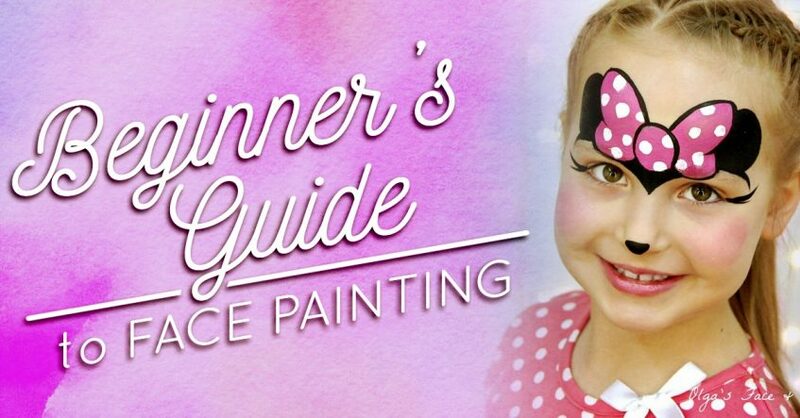 Check out their incredible before and after in this blog post. Sneak-peek! Very soon our team will expand with one more talented instructor that will be guiding our French-speaking students — Elodie Ternois! 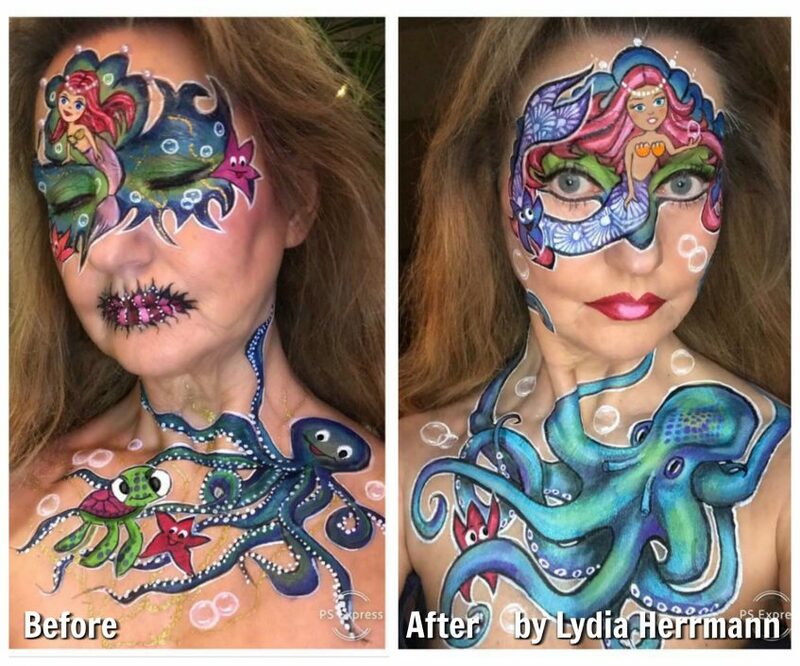 This stunning before and after by our student Lydia Herrmann shows the incredible improvement in skill-level or students achieve. This is the result of working side by side with our team of instructors on an exam piece. What a journey! I’m so glad I started it. Only a few weeks ago, I would never have believed that I could paint something so complicated — and then on my own body as well. When my first piece was rejected by the school, I was so disappointed — I thought I had done my best and I could not do better! But Olga and Annabel believed in me and gave me courage! After their tips, I sat down and tried-and there were more and more ideas. They have sparked my creativity and my ambition. I can not express in words how grateful I am to these two lovely ladies. 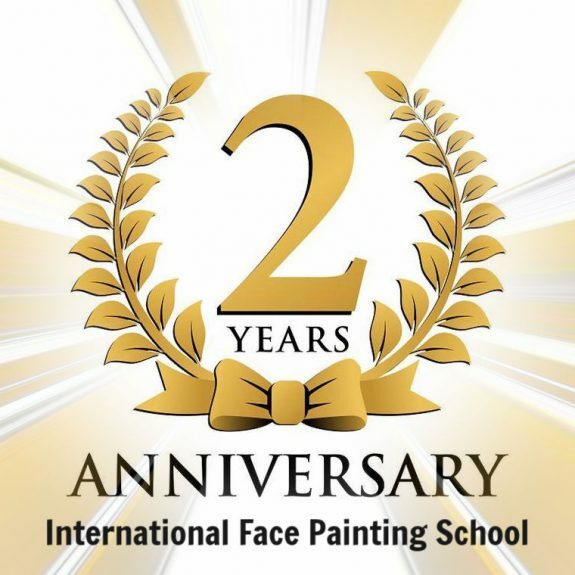 Any painter, no matter how long he has been working in his job, I can recommend this school. You learn so much and you get better and better. Specifically for newbies that aren’t ready to take the big leap into the Professional Course, we’ve compiled a light version that contains essentials of the main program — the Basic Course. Everything you need to give your career a professional start at an affordable price is here! After months of translations, adjustments, transferring content, and our blood, sweat and tears… so many tears we finally launched the Spanish version of the Course. 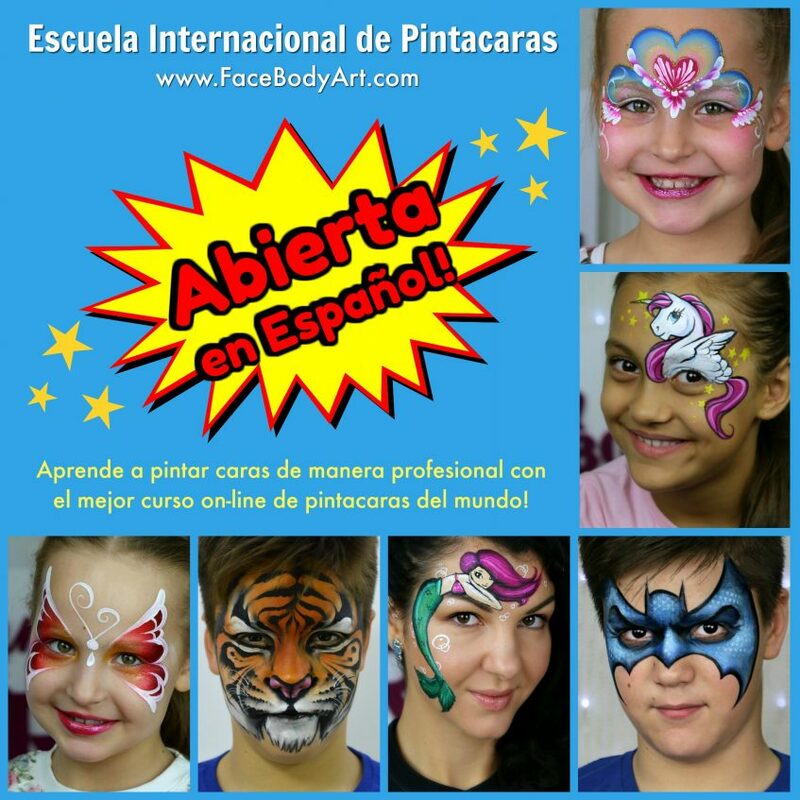 Check out the Spanish version of the School here: https://facebodyart.com/es/. 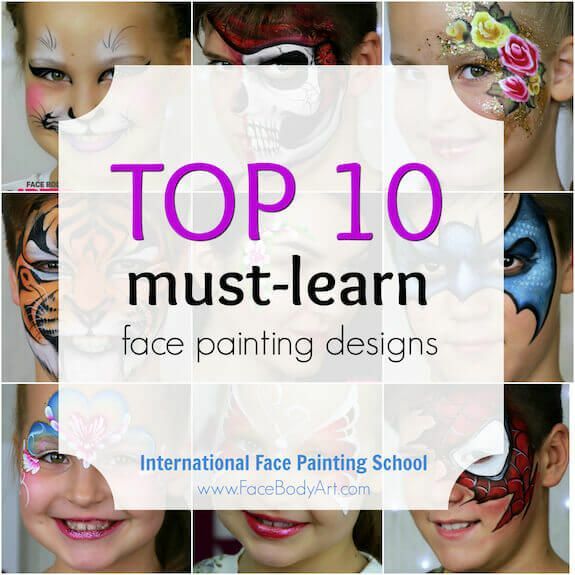 That means that the studies at the International Face Painting School are now available in FOUR languages: English, Spanish, French and Russian! 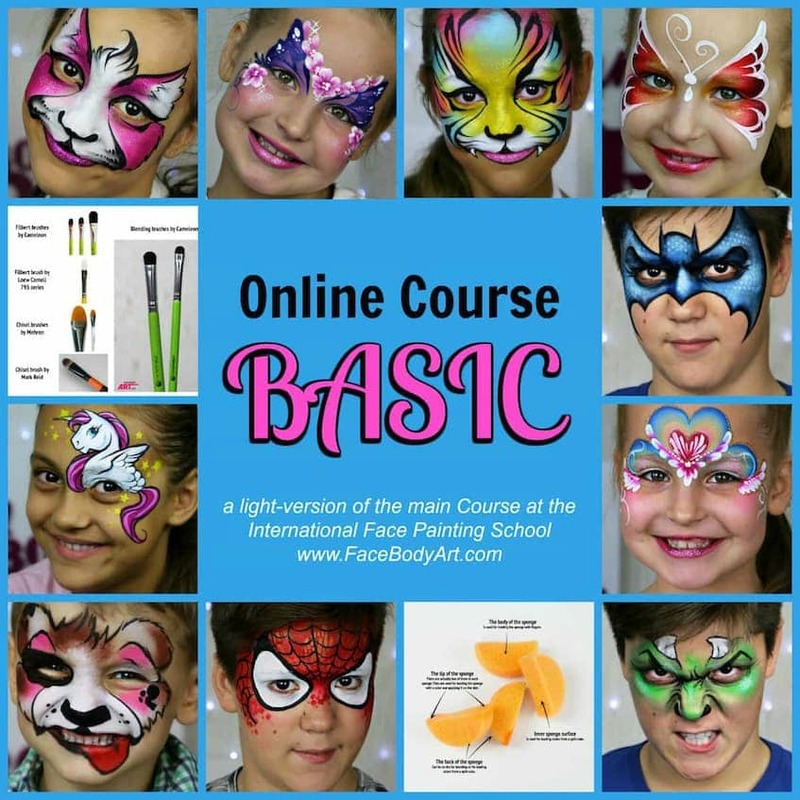 All our team, instructors, assistants and especially our blog author Kelli Zermeño worked very hard to share free education materials with the face painting community. 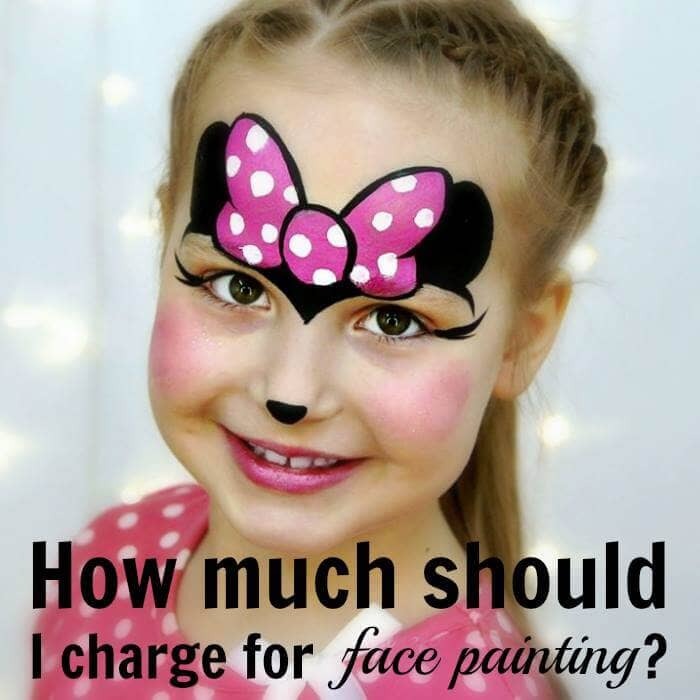 ⭐ We’ve added dozens of new blog posts to our Face Painting Blog, covering the most relevant and popular topics of the industry. Needless to say, it will greatly benefit your skills and career if you subscribe to our blog. We are proud to announce that our community of subscribers already contains more than 11,000 people! 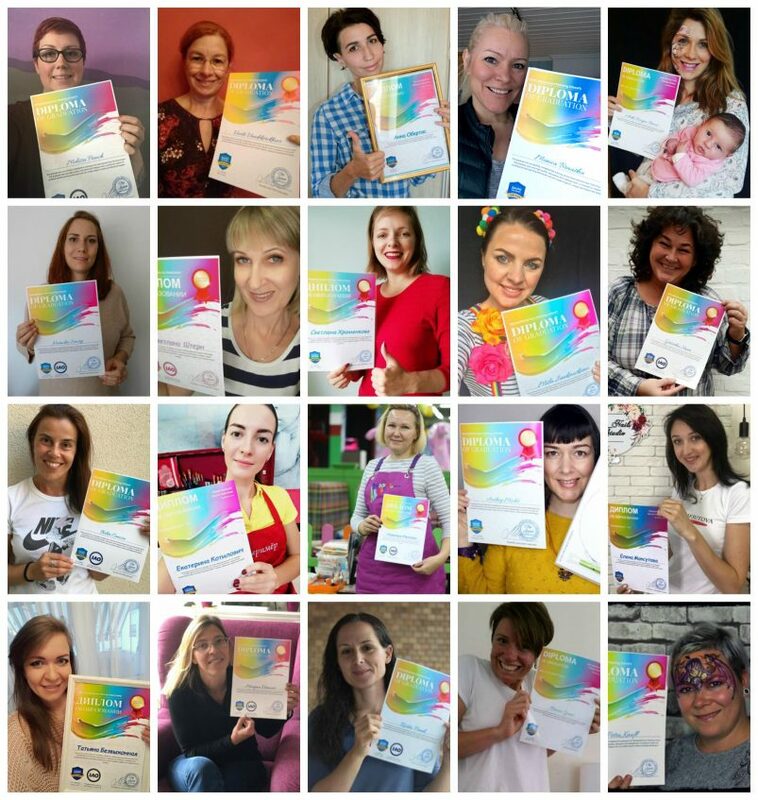 Don’t miss your chance to become a part of our community! Subscribe now! It’s FREE! 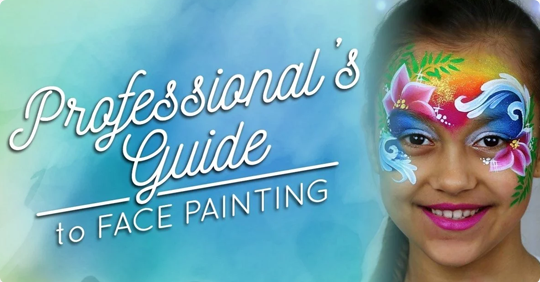 ⭐ We’ve launched the most complete Face Painting Guide for Beginners — an ultimate tutorial to get yourself introduced into this amazing industry without overwhelming frustration. 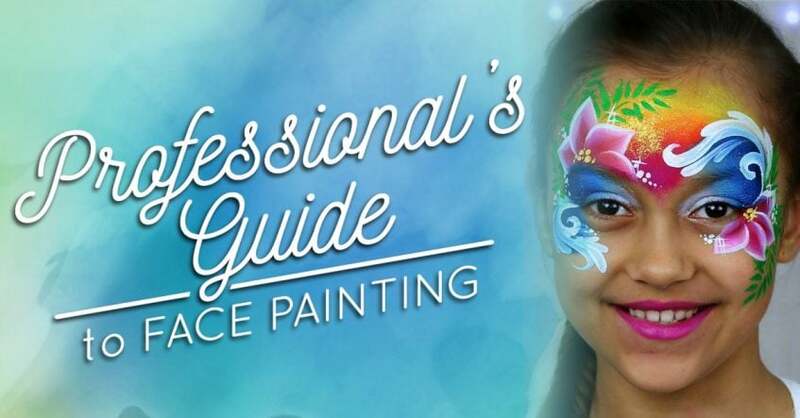 ⭐ And, we’ve also launched a comprehensive Guide for Professional Face Painters — specifically for those committed to making face painting their career. 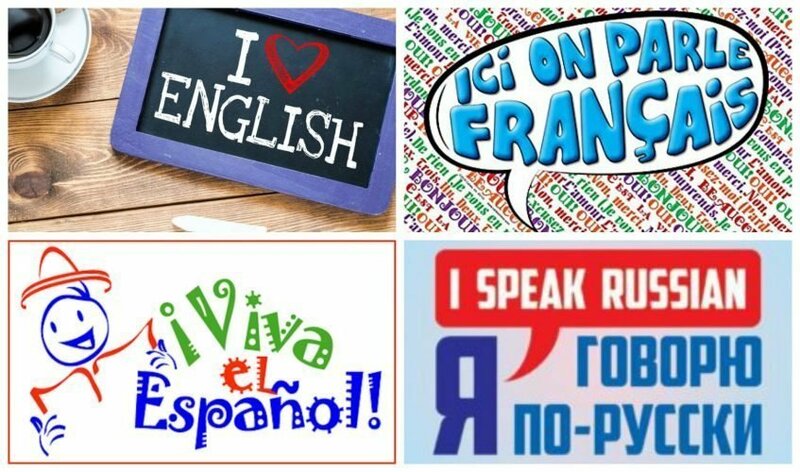 To prove once again that our curriculum meets the international education standards. We’ve applied to IAO.org and after months of hard work on rebuilding and checking our training system, we became an officially accredited institution! The IAO watermark is now present on all the diplomas of our graduates! 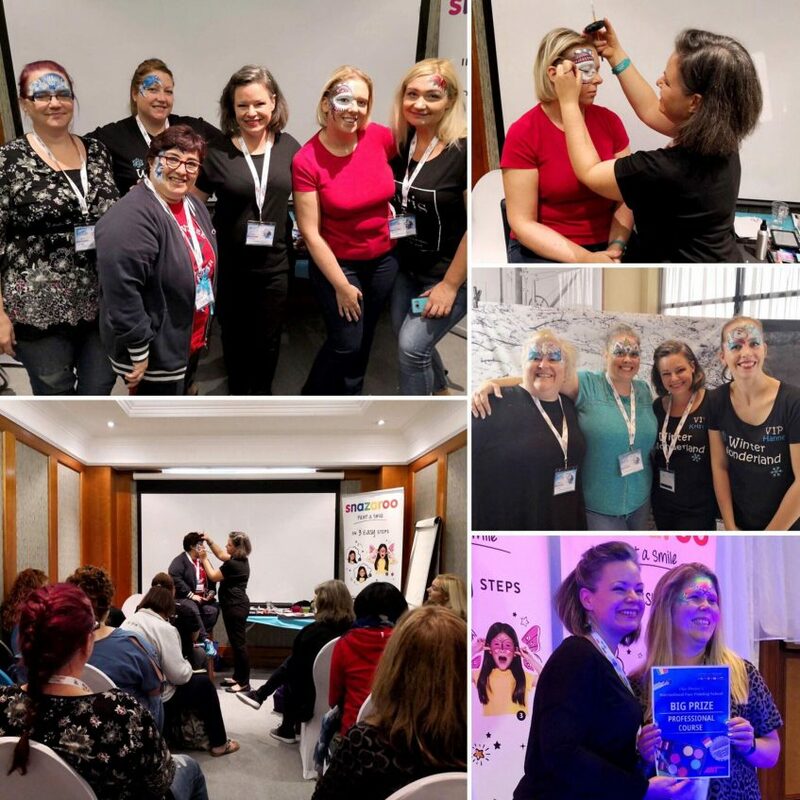 In April 2018th a group of more than 20 European students, graduates and instructors had the opportunity to meet in person and spend a wonderful time learning, sharing skills and simply having fun at Europe’s greatest convention — EFABE. Artwork by Olga Murasev, who was a guest instructor at EFABE in April 2018. 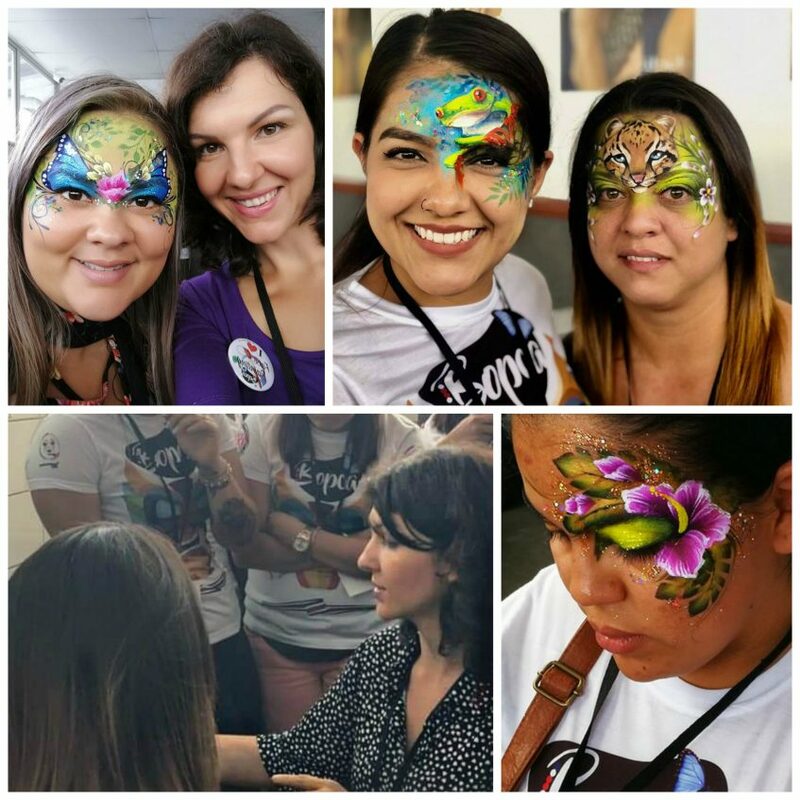 Next stop was one of the biggest Latino-American conventions in Costa Rica — BOPCA, where Olga Murasev was Abdullah invited to share her knowledge with the Latino-American face painting community. Artwork by Olga Murasev, guest instructor at BOPCA convention in September 2018. 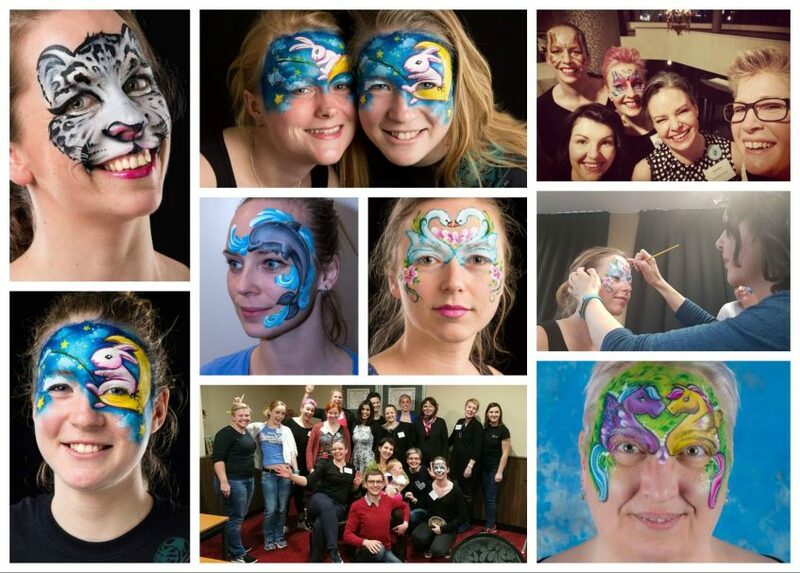 People that joined the UK’s biggest convention got a chance to learn from our instructor Kristin Olsson. Tip: Kristin Olsson, teaching at the UK convention in October 2018. This year in October our instructors Kristin Olsson and Elodie Ternois will be teaching at another big European convention in Belgium — the JAMvention. 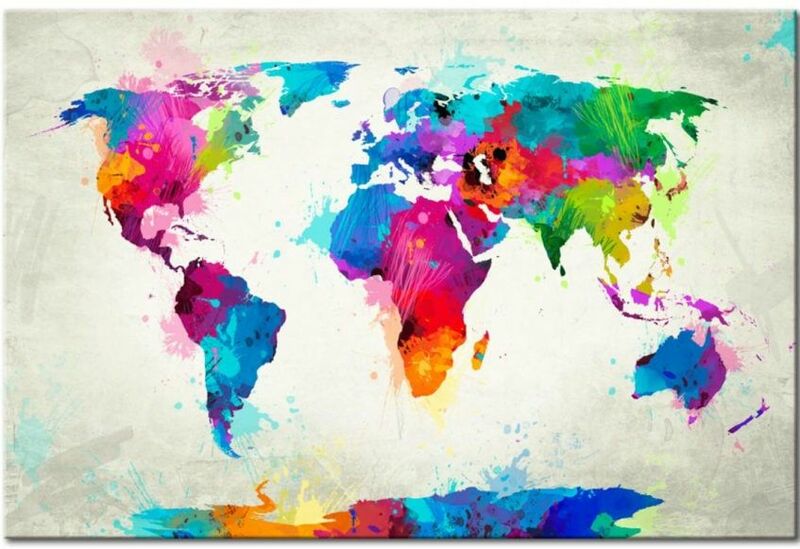 Also, all of our instructors are planning a series of private workshops in different European countries. Check out the schedule below and contact the artists for more information if you’d like to join one of the life classes near your hometown! Also, Annabel is constantly teaching life at her studio in the Netherlands. Contact her via [email protected] for more information. As you can see, we’ve got our sights set on greatness, and we predict that you will only get greater from here! The integrity of the School and our students’ success is number 1 on our list, and we will continue to uphold the highest standards for you, our students.